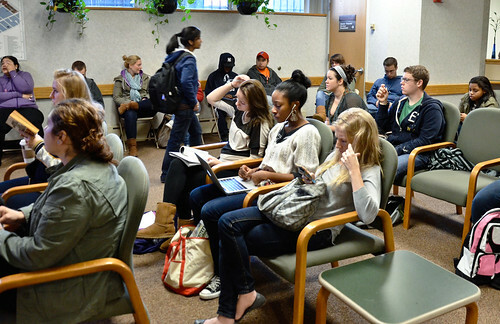 GRACE DICKINSON TTN Students wait in the Student Financial Services office. To process financial aid requests, the office did not answer phones during certain hours. As registration for spring classes takes place, roughly 8,000 students have their accounts on hold. Student Financial Services is working to fix a number of issues this semester. After taking a year off of school while living in Philadelphia, Jane Sorensen was accepted to Temple this year. Although a Student Financial Services representative told her that she would be considered a Pennsylvania resident and receive in-state tuition, she was later told otherwise, she said. Before the fall semester even began, Sorensen received an email explaining she was now considered an out-of-state student because her mother, who resides in New Jersey, claimed her as a dependent, the senior communications major said. About a month later, Sorenson said she went to the SFS office, where an adviser said her account had a balance of $19,000 and that she was barred from class registration until she paid. She said the office did not mention that one of Sorensen’s loans simply had not processed yet. Now she shares a predicament common among students: accounts are being placed on hold pending the approval of their financial aid, barring them from selecting courses for the upcoming spring semester. Sorensen is one of 8,000 students with their accounts on hold, according to university officials. Director of Student Financial Services Jim F. Morris said that holds are “nothing new,” adding that this semester’s 8,000 holds are less than the 9,700 holds from last fall. Morris assured that if a student’s financial aid package will cover their tuition payments, their hold and late fee would be waived. Morris is retiring in May, and a university-wide search committee will begin national advertisement of the new director position this week. Jodi Levine Laufgraben, vice provost for academic affairs and assessment, said that SFS gave students as much time as they could to finish their financial aid requirements. But some students said they were unaware of missing requirements before their holds went up, and felt that service at SFS was rushed and unhelpful. Megan Edwards, a senior English and history major, said she would never have known to fill out particular missing forms if she hadn’t gone and visited the SFS office herself. She said that her experience with the facility this year was more difficult than in prior years. Kimberly Benns, associate director of Student Financial Services, said through an email that student satisfaction is a challenging task for SFS staff due to an increased complexity in students’ fiscal circumstances. The new system that Laufgraben mentioned is Self-Service Banner, which replaced Owlnet last year, in phases. Last March was the first time students registered classes in SSB. In the summer, teaching faculty began using the system for grading and financial aid was handled through it for the first time, Laufgraben said. The banner system was implemented in pieces to slowly acclimate staff and students to its settings. But Morris said he believes that both groups still seem to struggle with the change. “I think there’s a lot of frustration on our staff’s part and on students’ part, because students don’t understand the new processes and our staffs are learning the new processes,” Morris said. The SFS office currently consists of 45 full-time employees and six vacancies, with three new hires to begin training on Nov. 7, Benns said. This year, an all-time high of 35,141 undergraduates applied for financial aid, Benns said. Last year, 32,065 applied. This semester, SFS has also chosen not to answer phone calls during certain hours, in an attempt to process financial aid requests. Benns said the office’s phones were put on an automatic message during peak volumes of activity so students don’t have to be put on hold. Laufgraben said there has been an increase of people answering phones, but most cases require students to visit an adviser. SFS closes after 1 p.m. on Fridays to dedicate more time toward processing student financial aid, Benns said. Employees continue to work until after 5 p.m. on Mondays through Thursdays, and also on Saturdays, in which they are “compensated in accordance with their respective contracts,” Benns said. However, Laufgraben said that SFS is conscious of student dissatisfaction, and that a series of debriefing meetings have gone underway to solve issues with its service. A meeting will be held this week, with more throughout the semester, and a student, whose identity is not made public, will be participating in the meetings, Laufgraben said. Although SFS is working toward fixing its service by simplifying language on SSB or by considering open labs and training sessions, Sorensen, who said she would consider transferring if it wasn’t her senior year, remains skeptical when entering the SFS office. The meeting was preceded by an Oct. 12, meeting between TSG officers and the new director of Student Financial Services. for the sake of our hard working student body at temple..i pray that the hold on registrations are waived considering that the university is more than aware that financial packages are approved at later times during a students semester! our children dont need the undue stress! The fundamental issue this time around is that there was no notification of outstanding requirements. SSB makes registration easier but the financial aid section is stupid, to put it plainly. It shows me what is required, and says there is an outstanding requirement link that leads to the forms I need, but there IS NO LINK. It is just illogical. Additionally, as someone who works 2 jobs and lives far off campus, not answering the phones is absurd. Notifying me of outstanding paperwork (taxes, which I have never had to submit before!!!) on Friday, when you close early, about something due Tuesday, is not sufficient. As a public school, Temple needs to recognize that a lot of students will be in need of and using aid, and sync their systems or develop one that functions to be HELPFUL to students instead of detrimental. The Federal Government was late in approving loans because they were tied in with the debt increase legislation that didn’t pass until August. That meant that States were also late in approving loans. As a result SFS got jammed up and couldn’t process loans fast enough because they got off to a late start. That was beyond Temple’s control. What was within their control? The system, the support staffing, and due dates. The system was apparently untested (at least from the outside) and instructions were cryptic at best. Problem resolution was only possible by speaking to SFS staff. My average wait for assistance by phone was 40 minutes, when they were working. New students got bumped to the end of the line because SFS processed continuing students first. SFS was able to resolve all my problems, but never with anything that was available or explained via the self service system. Temple’s response to these issues? Billing errors and a rigid adherence to a payment schedule that they, themselves, couldn’t support. The victim’s? 8,000 “holds” (lets call them customers), rounded to the nearest thousand. Sounds like lots of overtime for “those compensated in accordance with their respective contracts”. Meanwhile students who should be concentrating on studies are getting a different kind of education.